Papa Lemon and Mama Sarah are the neighborhood grandparents in the small town of West, Mississippi. 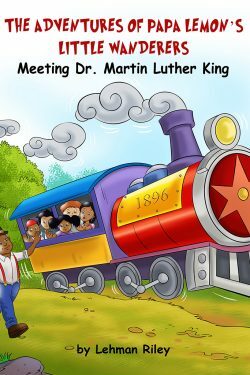 Papa Lemon helps five multi-cultural friends learn about our nations diverse heritage by sending them back in time via a magical train. The friends visit Dr. King at his famous “I Have A Dream” speech and learn the qualities of being a great leader. So it appears we still need to work on spelling and grammar, but as far as fun stories for kids and adults who read to and with kids, Papa Lemon books are great. It’s also a nice way for kids to learn respect for diversity and other generations. In the interest of full disclosure, I am a friend of the author’s cousin, who is the director of marketing for Papa Lemon books. I believe in the good that the books can do or I would not be able to recommend them so highly to my family or other kids.